A1 Heating and Cooling technicians always arrive on time as scheduled. Our technicians come with fully stocked vehicles so they are prepared for any situation that may arise from your air conditioning and heating. Our technicians also always cover your floor with a protective layer any place we service in your home. This prevents any dirt from being tracked in and maintains the cleanliness of your home. When choosing to repair or add an air conditioning system to your home, it’s important that the system meets the home comfort needs of you and your family. We supply a large variety of air conditioning systems that can be customized to exactly what your home needs. Everyone looks for ways to keep themselves comfortable during the hot summer months. The easiest and most practical method to do that is to change the environment of your home. The good news is that here with A1 Heating and Cooling we install air conditioning units that produce cold air guaranteed. 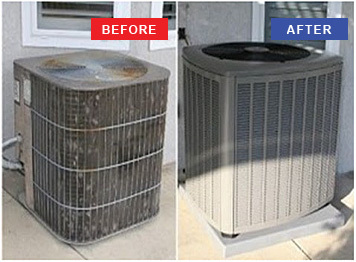 We want to service you with the best AC system and the most memorable and reliable customer service. All of our air conditioning installations come with an elevated condenser pad fitted underneath the condenser. This platform protects the compressor from ground-level harm while keeping it out of the way from your backyard activities and furniture. With performance-based selections, you can choose an air conditioning unit that best suits your home. Take control of the quality of the air you breathe today. Before cold air pours into your rooms from the air vents, also known as registers, existing air from inside your home is pushed through the filters of your furnace. Yes, the furnace is part of your AC system. At this stage of air conditioning, A1 Heating and Cooling makes sure to provide different air filter options to ensure a high level of indoor air quality, minimizing the pollen, allergens and other particles.